When you think of the Twin Cities, snow nearly always comes to mind. The cold, bright winters of Minneapolis/St. Paul might be daunting for the less resilient, but Minnesotans take them in stride. In fact, they enjoy the heck out of all their snow. One of the ways they do that is bundling up from head to foot and going out sledding whenever the opportunity presents itself. Minneapolis might be the bigger, and some say better, of the Twin Cities. But St. Paul is better in at least one respect: hills. And when the snow falls, the most sledding spots are in the STP. Minneapolis has two designated sledding spots, while St. Paul has 15. So while the local terrain is mostly flat, there are plenty of fun hills in St. Paul, Minneapolis, and all around the metro area. 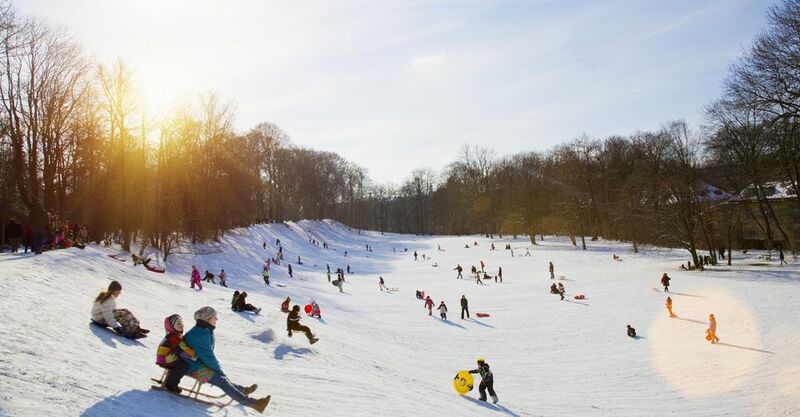 Here's a rundown of sledding hills in Minneapolis, St. Paul, and the Twin Cities region. Columbia Park Golf Course in Northeast Minneapolis is one of the steepest hills in the entire region. Theodore Wirth Regional Park, west of downtown Minneapolis, has a sledding hill with a tow rope. Matthews Park, Powderhorn Park, Fuller Park, Lyndale Farmstead Recreation Center, and Beard's Plaisance are unofficial and perhaps hazardous sledding hills because of trees, lakes, and other obstacles. The Minneapolis Parks and Recreation Board recognizes that sledding takes place at these parks and wants you to know that it is at your own risk. Fifteen St. Paul parks have designated sledding hills. Some are gentle, and others are seriously steep. So choose your desired thrill level and tolerance wisely. The best is the city is in Battle Creek Park, a steep hill that's lit for sledding until 9 p.m. What could be more fun on a cold weekend night in January than a ride down a hill on a sled under the stars (with a little electric light to see by)? The city of St. Louis Park's Minikahda Vista Park has a long, fairly steep, wide-open hill, ideal for sledding. Oak Hill Park is popular with families. This inner-ring suburb has 10 more parks that have what it calls "sliding hills." Vadnais-Snail Lakes Regional Park has a sledding hill, conveniently right by the park's Snail Lake parking lot. The park has more than five miles of trails, so along with sledding, plan on a bracing walk in the snow and views of the frozen lake. There are two hills at this scenic golf course, one slower and smooth, the other faster with bumps. The course puts on a different face in the wintertime. Park in the golf course parking lots and look for the sledding hills behind the clubhouse. White Bear Lake is 18 miles from Minneapolis, about a half-hour drive.